With this compact folder, pack a suit into any size travel bag and keep it wrinkle-free and ready to wear. Walk into an important meeting in a wrinkled suit, and you've defeated the purpose of wearing it. 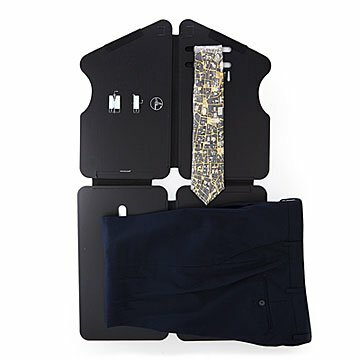 With this compact, packable suit folder, you don't need a personal valet to arrive looking smart. You're probably familiar with shirt folding guides that you remove once folding's done. This system is different: You fold your suit jacket, pants, and tie around it and pack the whole thing in any size bag, even a backpack. It stays impeccable, and you've also saved space (and avoided having to lug a garment bag). Comes with clear, diagrammed instructions. Made in China. This compact suit holder is a must-have for frequent travelers. Suits are such a hassle to pack...this is so compact and was a much appreciated gift! This was perfect for my boss' birthday. He travels and speaks often so he needs a suit that looks good and travels well. This suit-folder was reasonably priced, unique, and something he said he would definitely use. Suits, jacket, blazers and dresses really for any dressy outfit you want to keep together. Great for a when time for changing is tight.